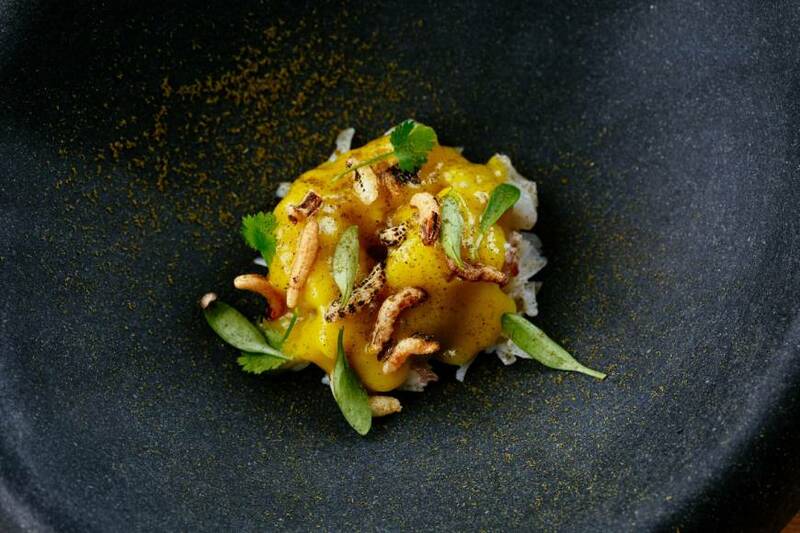 This dish from Good Food Guide Chef of the Year 2019 Gareth Ward, owner of the Michelin-starred Ynyshir Restaurant and Rooms, takes the humble katsu curry, switches out chicken for crab, and elevates it to a glorious, fragrant mouthful. 1. Cook the crab in simmering seasoned water (or use pre-cooked crab). Once cool enough to handle, remove the white crab meat and leave somewhere warm once picked. 2. On a medium heat, cook the onion and garlic paste in some sunflower oil. Cool out for five to 10 minutes, stirring constantly. 3. Add all the spices. Cool for about five minutes, constantly stirring, then add the chicken stock and soy sauce and bring to the boil, then simmer until thick. 4. Blend and pass through a sieve until smooth. Season to taste with soy sauce and rice vinegar. 5. Divide the crab into four bowls and spoon over the room temperature curry sauce. Garnish with puffed rice and chopped fresh coriander. Recipe courtesy of Gareth Ward, chef owner at Ynyshir. Visit ynyshir.co.uk for more.